The Dodgers came into today winners in five of their last six, whereas the Brewers have lost seven in a row. However, an absolute disaster of a game from the Dodgers meant the Brewers evened the series with a 4-2 victory. The game started eventfully, with the Dodgers working opposing starter Chase Anderson for a whopping 43 pitches in the 1st. Singles from Joc Pederson and Matt Kemp, as well as a walk from Yasmani Grandal, loaded the bases with two outs. In danger of coming up empty handed, Chris Taylor came through by lining a single to left to plate two runs and provide an early 2-0 lead. Cody Bellinger would follow with an infield single to load the bases again, but the Dodgers couldn’t take advantage of the chance, which would be a theme. After three consecutive 1-2-3 innings for the bats, the bases were loaded again in the 5th behind a Clayton Kershaw walk, Joc singling sharply up the middle, and Manny Machado emulating Joc. What looked like a prime chance to blow the game open ended up in disaster, as Kershaw was thrown out at home trying to score on a ball that briefly got away from the catcher, Kemp struck out wailing at spin, and Max Muncy flew out routinely to left. Well, at least Clayton tried to make up for his TOOTBLAN with his performance on the mound. In his six innings of work, he gave up seven hits but walked none, striking out five. But while he allowed just one earned run, he also allowed three unearned runs thanks to a defensive disaster behind him. Kershaw surrendered one unearned run in the 2nd on a catcher’s interference call on Grandal and Muncy gifting a “single” immediately afterward (he could’ve easily had like five or six errors today instead of three if not for Cody). Then again, he was also helped by Machado showing off his double-plus arm deep in the hole at short. In the 6th is where things really got messy, the Brewers tied the game behind a solo shot to dead center from Christian Yelich, unsurprisingly on the first pitch. While Kershaw also then gave up a double, he got two outs and looked to have escaped the inning by inducing a high chopper to Muncy. However, Max continued his no-good-very-bad-day defensively by completely whiffing on the ball, which led to the go-ahead run scoring. 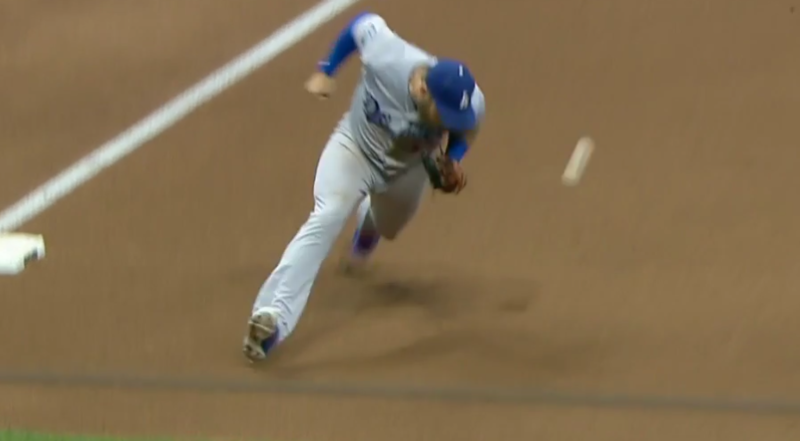 Kershaw then surrendered a triple into the right-center field gap, but with a catcher running on the bases they had a shot at home … or at least the would’ve if Taylor didn’t bobble the ball in center, allowing the run to score easy to make it 4-2. As if to make matters worse, Josh Hader immediately entered in the 7th for his first appearance since he’s had to answer for all the fucked up things he tweeted years ago, and was given an ovation. Kemp doubled off Hader with two outs and Muncy followed by lining out to first, as if to make things as frustrating as possible. Anyway, JT Chargois relieved Kershaw in the 7th and ended up getting five outs without allowing a hit or a walk before being relieved by Zac Rosscup in the 8th, and he promptly got out of the inning without drama. Regardless, the Dodgers couldn’t push anything across in the last eight innings of the game, squandering the chances they did get in spectacular fashion. Well … the good thing about baseball is there’s always tomorrow. 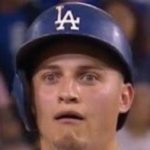 The Dodgers drop back to 10 games over .500 at 54-44, and see their NL West lead reduced to one game, with the Diamondbacks still playing. The rubber match of the series will be tomorrow afternoon at 8:10 AM HST/11:10 AM PST/2:10 PM EST, with Alex Wood squaring off against Brent Suter.